British politics is not easy for a continental European to understand. The differences between continental Europe and Great Britain are easy to spot as soon as you land in the UK. For starters, the border is actually a thing, with passport checks making you remember that it’s a privilege to live in a borderless continent. Then you change the currency and remember that not long ago people who lived in border regions had to carry around two wallets with two currencies. When you go out of the airport you are reminded that people here drive on the other side, and when you get to your accommodation you remember that the plugs, and even the water taps, are different. But also in the political system, the differences are major. The upper house is non-elected, the head of state is non-elected and the chamber of Parliament can’t actually physically fit all the democratically elected members of Parliament – and yet Britain arguably is the EU member state that most often complains about the EU’s democratic deficit. The political differences also exist in the Green movement. Brighton is not your typical Green stronghold, yet it has become the safe seat of Britain’s only Green member of Parliament. Brighton and Hove, a double centered city, is a coastal city with little less than 300 000 inhabitants. It’s not a particularly diverse city (80% of the population is British White compared with the 45% of London) but it has established itself as a main touristic destination and a LGBT capital. The reasons for this are understandable. The UK has a non-proportional electoral system that benefits the two big parties. This makes it difficult for national smaller parties to reach the Parliament. The Greens managed in 2010 when they turned a 13-year old Labour seat into a small Green majority, and since then made it a safe Green seat. This tactical vote is easy to see in the city of Brighton and Hove. The city has three constituencies for the British parliament. While in Brighton Pavilion the Greens are the strongest party followed by Labour, Brighton Kemptown was a Tory seat that now Labour won with the help of the Greens that did not present a candidate. In Hove Labour kept their seat, while the Greens were only the 4th party with less than 2% of the vote. Those 3 Left-Green seats are the only ones in a sea of Tory-blue that fills the south of England. A British election night is something unique even for those who follow electoral nights on a regular basis. The electoral system makes the actual result of each constituency very important and the way votes are counted means that the final result can only be known when the sun is already up. Two things made this one an even more exciting night: the early exit polls predicted a hung parliament, meaning that no party would have a majority, and so every seat really counted to see which majorities could exist, and Brighton Pavillion, where I was following the election, was one of the last constituencies to be called. The Green election night was of a party since the beginning. The prospect of a hung parliament as announced by the 10PM was a victory of all those who spent the last weeks campaigning against a new Conservative majority. It might have been a bubble – among Greens in a safe Green seat – but the feeling was that there was a real progressive alliance among the activists, even if the party elites hadn’t reached such a deal. Every time the Tories lost a seat, either to Labour or the LibDems, a small party erupted. This was especially true for the seats of Brighton Kemptown and Hoven, that were celebrated as if the Greens had won. All Labour wins were met with great satisfaction and Jeremy Corbyn’s speech in Islington was one of the most applauded of the night. One of the moments of the night was when Nick Clegg, the former LibDem leader, lost his seat to Labour. The progressive alliance might be a reality but the reality of the coalition government policies against youth are still widely remembered. On the other side, the huge loss of the SNP were felt as own loss. The SNP has been close to the Greens in Scotland, the UK and the EU, and the Greens share the proposal for Scottish independence. The confirmation of Mhairi Black as the MP for Paisley and Renfrewshire South was received with relief. One week has gone by since that night and a lot has changed. The Tories, that fell short of a majority, have gone forward to form a government counting on the support of the DUP. The Labour Party has appeared united around Jeremy Corbyn like never before. The SNP seems to have put independence out of the plans. Tim Farron has resigned as LibDem leader giving space for a new leader for the third most popular party of Britain. The future of the UK is uncertain and not even Brexit seems to be a given, but the future does seem to be that of a progressive alliance. At least if activists are listened to. 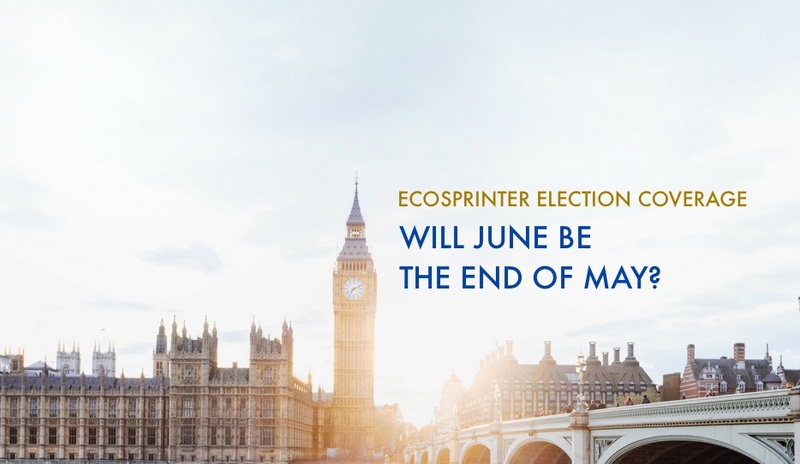 Filipe is a Member of the Ecosprinter Editorial Board and is currently touring the UK to report live on the happenings in Brexit-country around election time. Tagged United Kingdom. Bookmark the permalink.